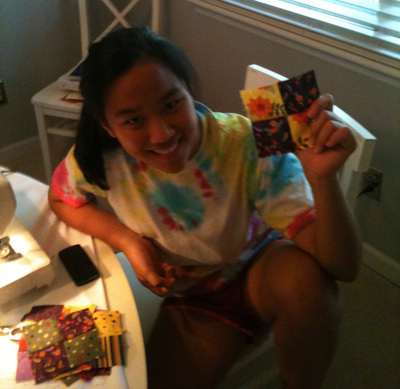 I’ve been teaching my niece to sew. I got her a jelly roll several months ago and now that she’s on her summer vacation we’ve had 3 intense sessions. She’s done so well especially since she’s never done any type of sewing before. We stared by learning the basics of the machine and stitching the jelly roll strips together. The best thing about this machine is that it has special 1/4″ foot that has a metal edge on it. 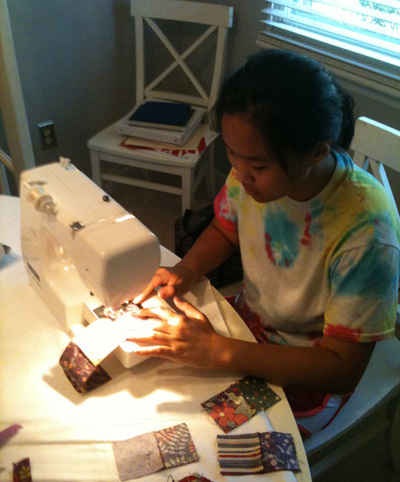 So 1/4″ seams are a snap especially for a beginner. Our lesson this weekend was a 4 patch. With all the strips together we trimmed the selvedges and cut the pieces to make 4 patch. Here is Meg with her favorite patch. 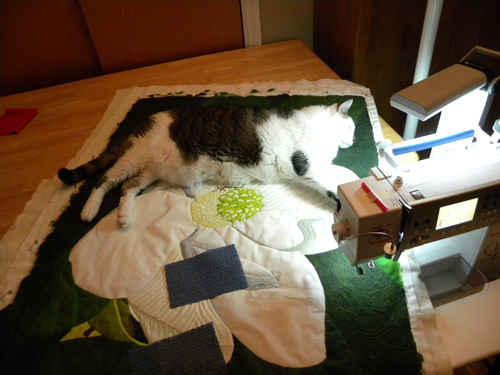 I spent a lot of time free motion quilting this weekend. Here’s the reason my stitches are a bit off.